Patience is not a virtue of mine. In a traffic jam, I’m a short breath away from abandoning my car and walking off into the wilderness. I pick up hobbies and swear them off forever if I find that I’m not a master knitter/painter/pianist within a month. I track my UPS packages every 20 minutes from the second I place the orders right up to when they arrive at my doorstep. Like I said, I’m not a patient woman, and I really don’t have the patience for an all-day sauce. 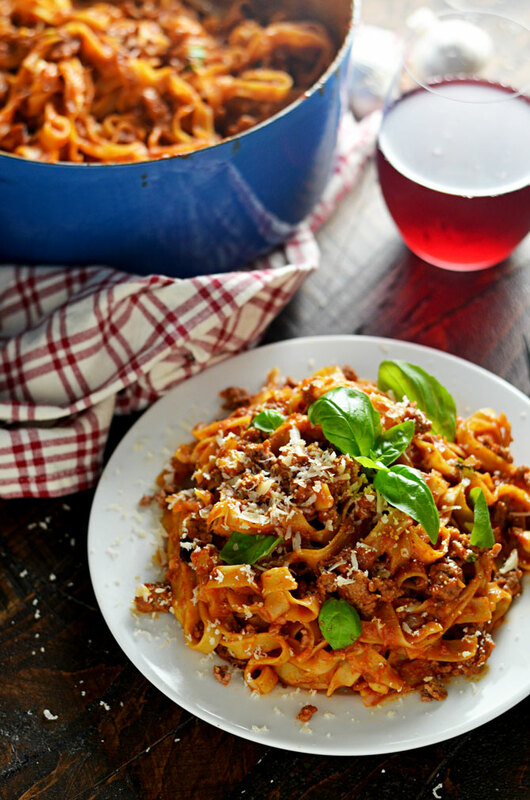 But ragu bolognese (or Italian meat-based sauce) doesn’t have to be a labor of love. 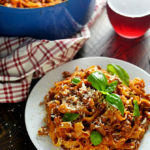 In fact, it doesn’t have to be hard or time-consuming at all, because One Pot Pasta Bolognese takes under an hour to make from prep to finish. 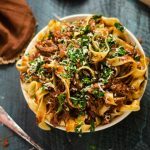 And despite the fact that this version cuts out a ton of time, making bolognese a weeknight dinner possibility, it’s not short on flavor at all. In fact, it’s gonna be HUGE! HUUUUGE. That was my attempt at an SNL-esque Trump impression. Did I pull it off? Speaking of which, is it just me, or do you also feel like you need some comfort food while keeping up with the presidential primaries? No matter who you’re rooting for (or against), doesn’t it get stressful every time debate season starts? 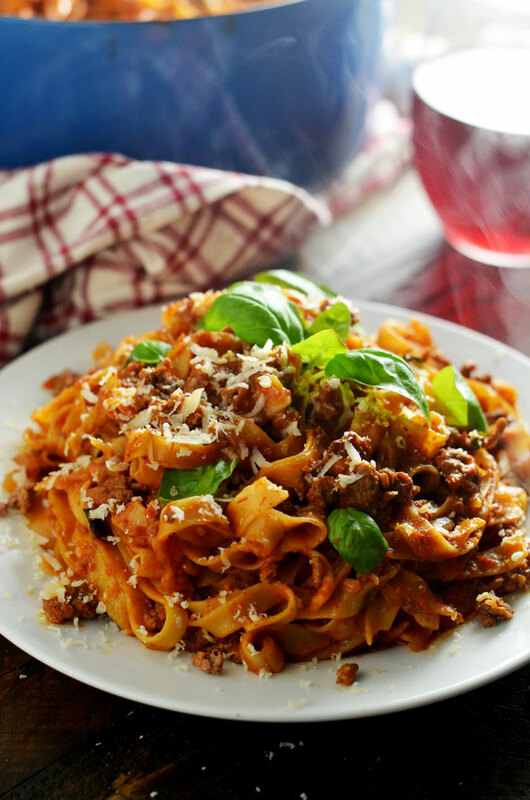 I just wanna snuggle up to a bowl of bolognese and shovel it in my mouth until the frustration subsides. And now I can. Ta da! To start making the One Pot Pasta Bolognese, I cook some bacon until lightly crisped, and then I add in onions, celery, and garlic, which cook in the rendered bacon fat. I know a lot of us are still in New Year’s resolution mode and “rendered bacon fat” probably doesn’t fall into the diet-approved category too often, but let this be your cheat meal and you won’t regret one bite. After seasoning the onion mixture, I brown the ground chuck in the same pot. Then it’s time for the tomato paste, which gives the sauce more slow-cooked flavor without the long time commitment, as well as the crushed tomatoes, chicken stock, and thyme. 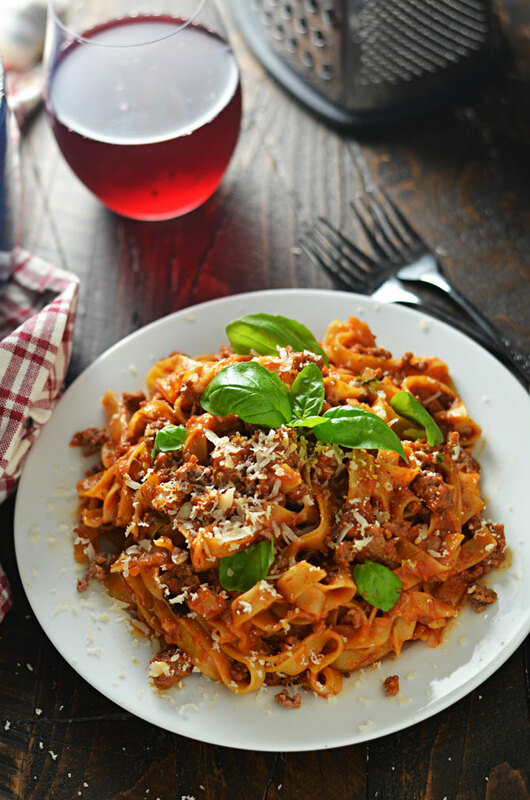 Generally, bolognese sauce includes wine, so if I have wine on hand I may choose to switch out a cup of the chicken stock for a cup of wine. It is delicious either way, so it’s truly up to you. I simmer the sauce to help the flavors develop and meld before adding in the pasta, which goes in uncooked. 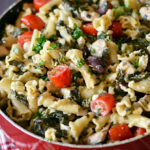 Remember, with one pot pastas, you really only need one pot! The uncooked pasta releases starches into the sauce as it cooks, which thickens the sauce. It also absorbs some of the sauce liquid, which flavors the noodles themselves with whatever they’re cooking in. Once the pasta has cooked, I stir in some milk, parmesan cheese, and basil. This makes the sauce creamy and rich, and balances out some of the acidity of the tomato. 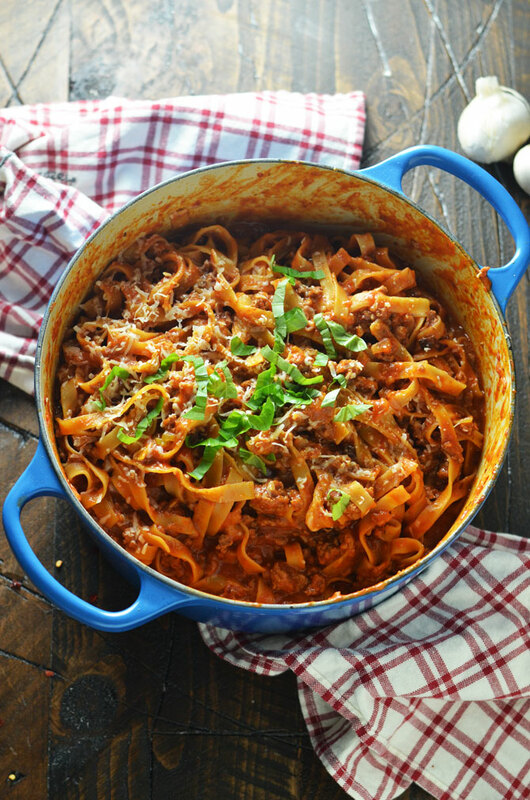 And just like that, the One Pot Pasta Bolognese is already ready to serve. 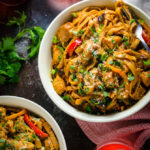 I knew James loved this pasta because it disappeared very quickly, but apparently it was one of his favorite one pot pastas I’ve made, as he told my family while we visited last weekend. My mom is really jealous that since I’ve moved, she hasn’t been able to try any of my new recipes. I guess I’ll just have to go down to visit and make another batch soon for us all to eat. Ugh, twist my arm why don’t ya? Really, this recipe is delicious, and I think it will be a hit in your house just as much as it was in mine. When you give it a go, don’t forget to take a photo and tag #hostthetoast on Instagram or Twitter to show off your simple, saucy, patience-free pasta. I can’t wait to see it. In a dutch oven or large skillet over medium heat, cook the bacon until lightly crisped. Mix in the onion, celery, and garlic, and season liberally with salt and pepper. Mix in 1/4 teaspoon red chili flakes, adding slightly more if you prefer more heat in your sauce. Cook together until the onion has softened, about 5 minutes. Add in the ground chuck. Cook, breaking up the meat with a wooden spoon, for 5 minutes or until browned all over. Once browned, stir in the tomato paste, crushed tomatoes, chicken stock, and thyme. 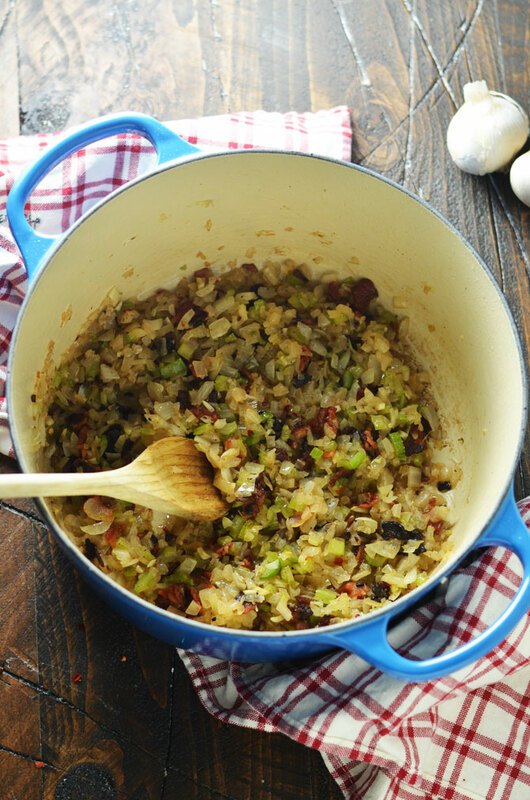 Bring the mixture to a boil, then reduce to a simmer, cover, and cook for 5 minutes. Then, uncover, remove the thyme sprigs, stir the pasta in, and continue to simmer for 15 minutes or until the pasta is cooked through and the sauce has thickened, stirring occasionally. Stir in the milk, parmesan cheese, and shredded basil, and adjust the seasonings to taste. Serve with additional basil, to garnish. Always red for tomato sauce. Made this tonight and it was amazing!! Looking forward to cooking more of your recipes 🙂 thank you! This sounds weird, but what’s the wine in the photo? The recipie was awesome, but the wine looks good too! Made this tonight for the two of us, will have leftovers for lunch or dinner all week. This was delicious and I love the one pot aspect. Thanks Morgan! This is such a favorite of mine. I keep coming back to this recipe and I love it more each time I make it. Drain the ground beef after browning or no….I know you said not to drain the bacon.